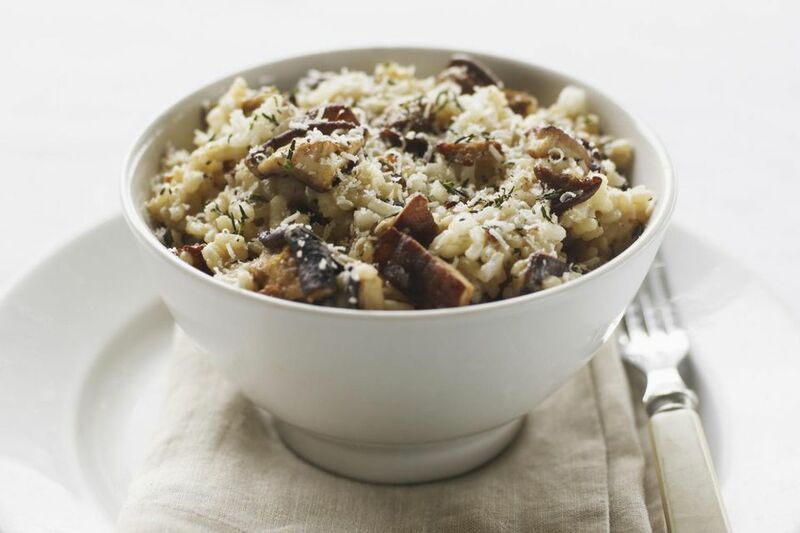 Mushroom risotto is wonderful, especially in the fall when the porcini mushrooms are fresh, but this dish is delicious when made with dried mushrooms too. If you cannot find fresh or dried porcini, you can use other meaty, fragrant mushrooms (such as chanterelles/giroles or morels). Steep the dried porcini mushrooms in 1 cup of hot water for 15 minutes. Meanwhile, saute the onion in 2 tablespoons of the butter (or 3 tablespoons olive oil) over medium-low heat. When the onion is lightly browned, transfer it to a plate using a slotted spoon and stir the rice into the butter (or oil) in the pot. Saute the rice for several minutes, until it becomes translucent, stirring constantly with a wooden spoon to avoid sticking or burning. Return the onions to the pot, stir in the wine, and continue stirring until the alcohol smell has evaporated, 1 to 2 minutes. Then stir in the first ladle of liquid (if you're using plain water, also add about 3/4 teaspoon of salt), and while it's absorbing, chop the mushrooms and strain the liquid they soaked in through a fine-mesh strainer, as it can contain sand. Add the chopped mushrooms and their strained soaking liquid to the rice, then continue adding water or broth a ladle at a time, stirring occasionally. As soon as the rice is al dente, turn off the heat, stir in the remaining 1/4 cup of butter, 1/2 cup of the grated cheese, the cream (if you're using it), a little bit of ground pepper, the parsley, and fine salt, to taste. Cover and let sit for 2 minutes. Serve hot, with the remaining grated cheese for sprinkling on top. This would pair well with a light red, for example, a Sangiovese di Romagna or a Valcalepio Rosso. Which European country will inspire your culinary journey tonight? Get our cookbook, free, when you sign up for our newsletter.